When I decided I wanted to get serious about running, I had several things to consider. How do I start? It sounds ridiculously easy. If you want to get better at running, then you go out there and run, right? For many people, this approach is exactly what worked. For people like me, who like things in neat little detailed packages, I needed some direction and guidance. If left to my own devices, one or more of the following would happen. Too far, too hard, too soon. Make EVERY run farther, harder than the day before. Clearly, I needed a plan. The first plan that looked realistic but challenging was the Couch-to-5-K plan. This is the Couch to 5K running program and it works. The program also has an app that will tell you when to walk, when to run, and how long until the next interval. The program assumes a person can walk comfortably for 30 minutes. The plan is based on walk/run intervals that gradually phase out the walking until you are running for the whole 3.1 miles. The plan can be based on time or based on distance. I highly recommend you pick one method of measuring and be consistent. Good running shoes are a MUST. Don’t use those high top basketball shoes or those trendy cross fitters. Get some real shoes. They do not have to cost a forturne, but you will save a fortune in ortho, x-rays, and physical therapy if you start off with good shoes first. Go to a running shoe store, don’t worry about how you might not look like a fit runner (yet), and tell them to please fit you in good running shoes. No pain, no gain: Not for beginners. The body will gently tell you if something is not right. If you don’t listen, the body will use a little more urgency. If you still ignore it, you could be sidelined for months or wind up in traction. It is normal for knees and hips to feel a little sore. It is NOT normal for agonizing pain to shoot from your toes, hips, shins, back, or knees. If you don’t do it, it won’t work. You can’t skip 5 workouts and expect to hit the 5K right on time. There is a lot of flexibility in this schedule. Use it, but don’t abuse it. Flexibility is one of the best parts about this program. 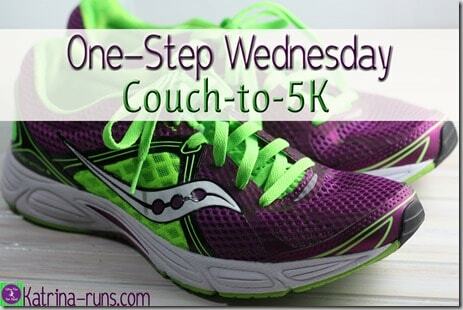 For the way your life is structured, it might not be 5K in 9 weeks. It might be 5K in 13 weeks. And in the grand scheme of many weeks of your life that you have spent wondering if you can be a runner, an extra few weeks of good training is so worth it. The article suggests picking a race 9 weeks from the beginning point and then starting the program. This is where I disagree. And here is why. For people who are brand new to running, and many to any strenuous exercise, 9 weeks is too far in advance to think about a definite schedule to running a 5K. I would suggest looking at least 12 weeks out from start. That will give you plenty of extra time to re-train a week and create some cushion for illness or life getting in the way. Some disagree, saying the structured 9 weeks will keep people on track. And that is true. My response is this: anybody is going to have the mental discipline to stick to 9 weeks should have the discipline for a little longer. If you are on week 5 and you get sick and miss some workouts, you will have the extra weeks to build back. What you will NOT do is cram 2 weeks of training into the next week, which is almost textbook maneuver for injury. You will NOT feel defeated and quit halfway through because you might not be ready for the "pick a 5K" that you’ve told everybody, God, your mother, and any friend on Facebook about.Give yourself some time. Go slow. Yes. slow. Turtles should pass you. Why? Ever see a turtle wearing a knee brace? Ever see a turtle with bottles of ibuprofen? Of course I’m kidding, but rarely will you see a slower runner crying from pain on the side of the road. Many injuries are "overuse", not "underuse". If you can walk comfortably for 30 minutes, start off taking some easy running steps to get the heart rate up. Do not go full force, Forest Gump, airplane arms, speed of light. Go speed of chocolate fudge pudding. Your knees will thank you. And then you can eat the chocolate fudge pudding after you finish your first 5K. This seems like a very sensible approach to building up fitness and I’d agree about the extra weeks. Thanks for this good explanation, especially your thoughts on the pros and cons of timing & planning.